An air hockey table is a game with two players, two pushers, and one puck. Each player must try and score a goal with the puck, and air from blowers in the table help to make the puck slide across the surface with ease. The market is full of wonderful tables that will fit into your rumpus or hobby room well. They all differ in size and style, but each help you to have a lot of fun with a friend or family member. However, the market is as diverse in the style as it is in the quality, which is why it’s important to research your options. Sending back an air hockey table you’re not happy with will be no easy task! The best thing you can do is find out what your needs are, how much space you have, and the style you prefer. From there, you can determine whether you want a manual or electronic scorer, the number of pucks and pushers, and if you want any flashy bits like sound, music, and arcade-style features. Then, factor in how much you have to spend. The market is vast, with a table to suit any budget. However, the more you spend, the more durable the air hockey table is. Now’s the time to view the high-quality options below and purchase a table that suits every member of the family. If you want an affordable, easy-to-use and fun air hockey table, then there’s every reason to buy this one from Harvil. There’s no denying it has a few issues, but as a whole, it’s a reliable unit that won’t cost the earth but will deliver hours of fun for everyone. Both adults and children can use this 60 x 31 x 26-inch table, making it a versatile option for families, and it weighs a mere 44 pounds too. Therefore, once you assemble it, you will have no trouble moving it to where you want it to be. It comes with dual electric blowers for an authentic experience, L-shaped legs and levelers to help it remain steady, and a battery-powered electronic scorer too. You won’t need a pen and paper to keep track of your scores. Sealing the deal is the addition of pucks and paddles – meaning you have everything you need to play immediately. There are, however, a few things you need to know. The assembly process can be tricky, the electronic scorer doesn’t come with batteries, and it only comes with a three-month warranty. 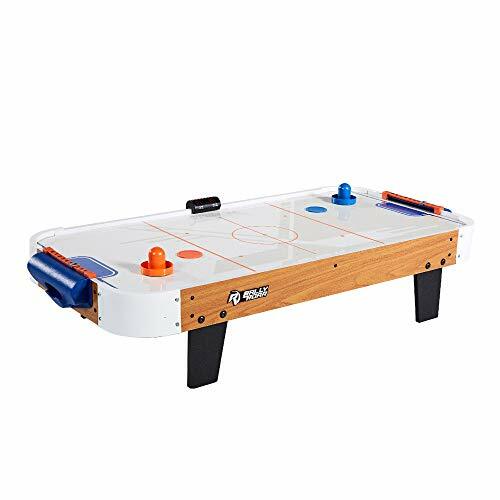 If you’re tired of TV being the only form of entertainment in your household, then it could be time to welcome an air hockey table into your family. This one, in particular, is an excellent example of a quality table – and one that’s affordable too. It arrives assembled, has solid leg supports, and you can fold the legs down for storage too. Some people say it can lose its integrity in shipping, but that’s nothing a bit of glue won’t fix. There are also many features of this air hockey table that are bound to impress. It’s 48 inches – perfect for a family game, and comes with a UL certified motor for your peace of mind. The pucks will glide over the table effortlessly. What’s more, it has two scoring options to suit your needs. You can use the LED electronic scorer, or opt for a slide manual scorer if you prefer it. Once you assemble it, you can move it comfortably to where it needs to be thanks to its lightweight frame. Then, make use of the included pucks and pushers that let you play right away. Even though the air doesn’t hit the corners of this air hockey table during a game, it’s still an excellent option and a fun way to pass the time. Trying to come up with ideas to entertain the kids is not that easy, but thankfully that’s what an air hockey table is for. 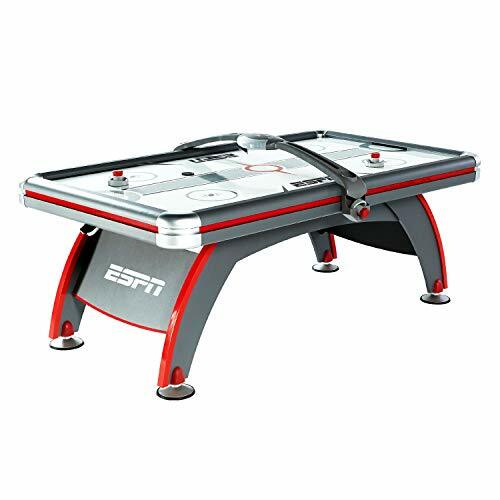 Instead of letting them watch TV all day, you can purchase this SuperShop ESPN air hockey table and let them while away the hours with competitive fun. 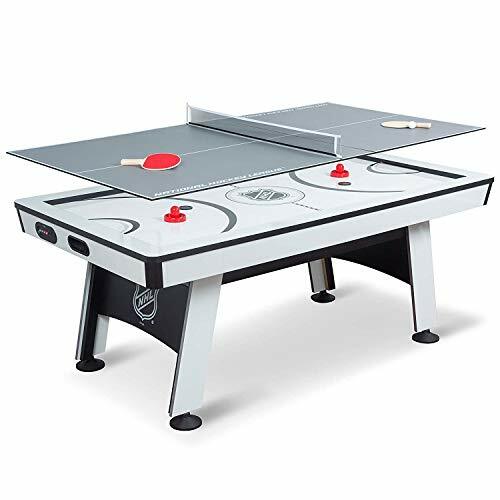 Both adults and children can use this 60 x 32 x 30-inch air hockey table. Its compact size makes it suitable for almost any area in your home, and it weighs a mere 40 pounds which makes it easy to carry. That’s not all this air hockey table has going for it either. Its 110-volt motor is reliable, it has two scoring methods – electronic and manual, and it comes with two pucks and pushers too. Therefore, once you assemble this table, you can get to work playing right away. If you have trouble with balance, the leg levelers can help with this, and if you don’t have the room for it to be up all the time, you can store it away flat too. There’s a lot to love about this air hockey table, so don’t delay in making it yours. 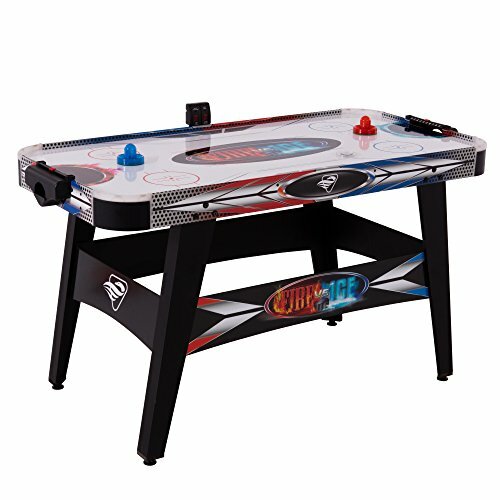 If your children’s school holidays are just around the corner, and you want something fun for them to do, then set your sights on this air hockey table from Goplus. Sized appropriately for children, but ideal for adults too, it’s an excellent addition to any rumpus room. It can also save you a fortune on trips to the arcade. What first appeals about this air hockey table is its style. It mimics an ice hockey rink and has full color graphics to stand out from the crowd. If that wasn’t enough to have you getting your wallet out, then the sizing options will. You can choose from 42, 48, or 54 inches to suit your needs. When it comes to scoring, this air hockey table trumps many on the market. It has both an electronic LED scorer and a slide manual scorer. It also runs the air supply on a 12-volt DC motor. Four legs on the table help with stability but, according to some buyers, these are not overly stable. You may like to have a plan B or a handy person in the house to make adjustments. This air hockey table is far from the best on the market, but it’s going to put a big grin on your kids’ faces all the same. The air hockey table market is massive, with many different options to suit a range of consumers. However, very few suit both competitive and casual players, which is what this model from EastPoint Sports aims to achieve. 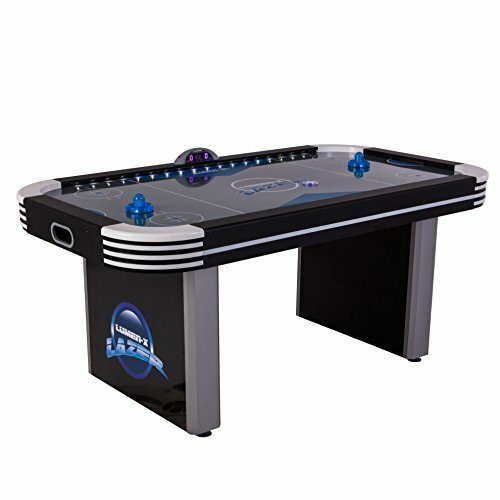 This air hockey table looks the part, offers a premium gaming experience, and is affordable too. It will suit any rumpus room or garage well, comes with everything you need to start playing, and has an effortless assembly process too. You can be up and running in no time. It’s also generously-sized for a proper game. Enjoy the 84 x 32 x 48-inch table with a leg leveling system that impresses. When it comes to air flow, this air hockey table is at the pointy end of quality as well. It has power corners coupled with a scratch-resistant GlazeTek compound to have those pucks flowing freely. This is quite an unusual feature that works well. Best of all, you get to enjoy the automatic sound and scoring system, but you need to remember to buy batteries separately. Don’t look past this air hockey table when you’re in the market for something fun for the family. You may have to empty your piggy bank to afford this air hockey table, but once you see all the features it has to offer, you won’t mind doing so. This air hockey table is the creme de la creme of tables. The first standout feature is its style. It’s sleek, well-made, and has excellent graphics that will appeal to many. Its color scheme also works in brilliantly with many rumpus or game rooms. Furthermore, it has a range of convenient features to further enhance your playing experience. It produces sound as you play, has an automatic scoring system, and even offers storage for your four included pucks and pushers. You’ll never have to worry about losing them! The forward goal design is also a nice touch, as is the scratch-resistant surface which will see the air hockey table last for years to come. This table is one that’s going to impress several different buyers – and possibly even you. Impress your friends and improve your game by trying out this new ESPN air hockey table with all the bells and whistles. It’s by no means the most affordable option for sale, but it’s a table that will cause you to be the envy of many of your friends. You can buy it in a foot length of five, six, seven, or eight, and even choose whether you want premium or standard steel legs. If you want an air hockey table that allows you to play straight away, then this one is it. Once you unpackage and set it up, you can play with four pucks and pushers – all of which are well made and ready to help you be at your best. The best is yet to come too. Enjoy the built-in storage, cup holders for your drinks, and even arcade game sound effects. 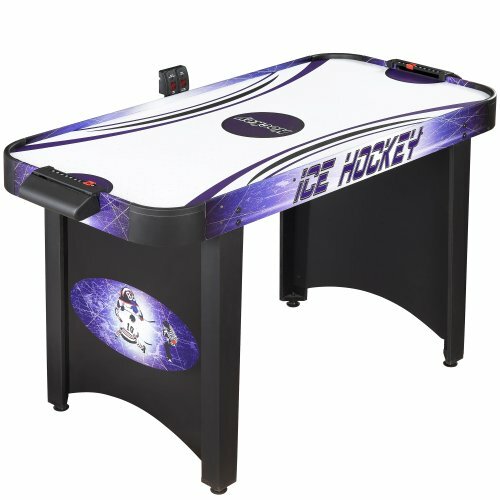 The air hockey table will also time your game, use projection lights, and take the score. Even the air quality is exceptional, with a UL certified blower mower completing the picture. If you’re ready to get competitive and want to do so on a premium table, then check out this air hockey table from ESPN. When you read through the list of features of this air hockey table, or even see it in person, it’s easy to be impressed. After all, it looks spectacular, and has all the bells and whistles reminiscent of a more expensive air hockey table. It features in-rail LED lighting, music, two motor blowers, and has a smooth PVC surface material for effortless use of the light-up puck and ultra-bright strikers. However, it’s the consistency of these features that tend to let this air hockey table down. Sometimes, the electronics don’t work, and even the sensors can have trouble recording your scores. Such reliability could have you looking at a different option. In saying that, when this air hockey table works at its best, it’s something impressive. It stands out from other tables like it on the market, and will look the part in any games or rumpus room too. This Voyager model air hockey table from Hathaway Games is a relatively new player to the game, but that doesn’t mean it’s not going to give other brands a run for its money. It’s solid, secure, affordable, and could become your new favorite activity in your downtime. When it comes to features, there’s a lot to love about this no-frills air hockey table. It features a smooth, clean surface, robust and solid legs, and levelers to ensure you have the most even gaming surface possible. It also comes with two strikers that are three inches and two pucks of two and a half inches. However, unlike other brands, these feature MDF material which may impact their durability. The style of this air hockey table is another standout point. With a blue and silver color scheme, it’s going to fit right in. 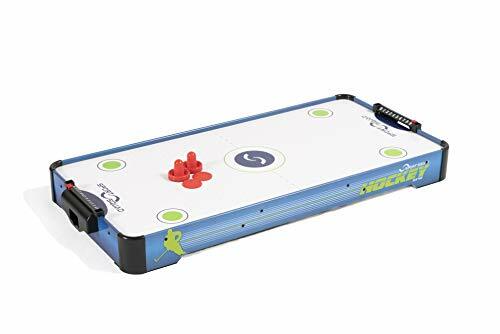 If you are looking something new to keep you or the kids occupied in your spare time, this air hockey table from Hathaway Games could be a keen contender. If you are fortunate enough to have a garage, rumpus room, or games room, then you may be looking for fun games to fill it. That’s where an air hockey table comes in. However, before you let excitement cloud your judgement, take a moment to review your options and take on board a few considerations. These points below can help you to make the best purchasing decision possible. An air hockey table, of course, relies on a blower system to provide air. However, not all of them are high-quality. When you start looking for a new table, read the comments regarding the blower systems. The best one has few, if any, blind spots where no air is blowing through, and has dual blowers. Pay attention to how the air hockey table takes your scores. Does it have a manual slider that you have to monitor? Or, does it have an electronic scorer? 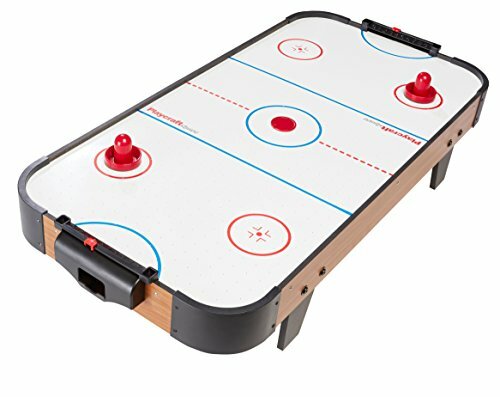 Many air hockey tables now come with electronic scorers, but it’s helpful to read the reviews to find out how effective they are. Some have inferior sensors that don’t pick up the scores, while others don’t last long. An air hockey table has to be level to be fair to both players, so find out what features are in place to make it so. Choose a table with robust legs and levelers to ensure an even playing surface. What is the surface made of? The smoother it is, the better the game. What’s more, you can end up with a premium hockey table if your surface turns out to be magnetic. Finally, after considering the table’s components, consider the accessories that come with it. 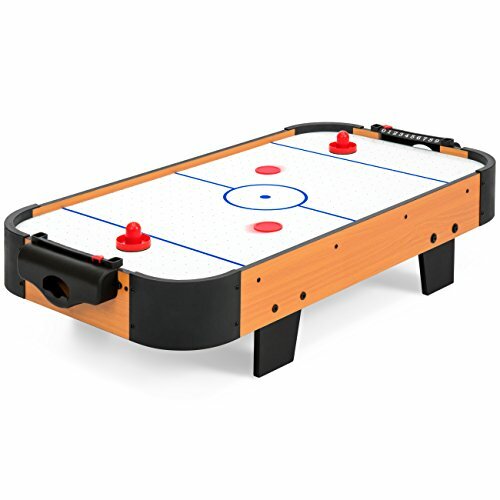 The best air hockey table is one that comes with pucks and pushers for you to play right away. An added bonus would be if it had storage for these and maybe even cup holders so you can have a cold beverage while you play.